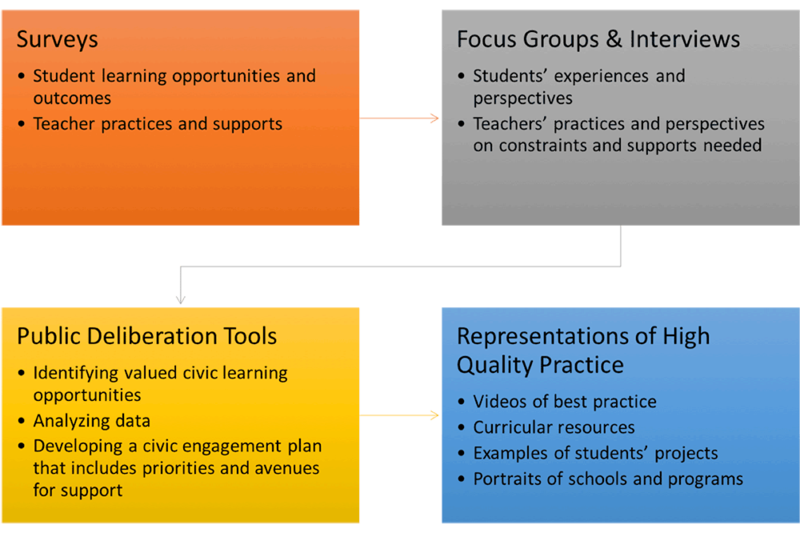 The Leveraging Equity and Access in Democratic Education (LEADE) initiative works with school districts and communities to implement a multi-faceted strategy for promoting young people’s equity and access to democratic education. One central part of our systemic reform effort is to work with key stakeholders to identify civic learning priorities in the district. We then develop research-based tools to measure what opportunities exist, who has access to them, the quality of those experiences, and the resulting outcomes. Next, we support districts to analyze and reflect on the data, engage in a process of public deliberation, and, ultimately, develop a civic learning plan to scale high-quality civic learning for all youth in the district. Finally, we support districts to identify and support professional development opportunities for educational leaders and teachers as well as elevate examples of high-quality practice in order to bolster efforts on the district, school, and classroom level. Through these various efforts, the LEADE indicator system and technical support efforts enable districts and communities to work together to promote high quality civic learning opportunities for all students. To read more about the LEADE initiative click here. Indicators can serve as a key resource for public deliberation on topics such as civic education as well as enable educators and community representatives to make evidence-based claims about the quality, sufficiency, and equity of civic learning experiences. Such public deliberation via an indicator system also encourages participants to identify valued forms of civic engagement as well as the learning opportunities young people need in order to develop the capacity and commitment to participate in these ways. And, finally, an indicator system can provide communities and educators with a framework and language by which to articulate the key elements of high-quality civic learning and how to go about making the changes needed to promote such opportunities for all youth. 9 Shavelson, Richard J., Lorraine M. McDonnell, and Jeannie Oakes. “What are Educational Indicators and Indicator Systems?” Practical Assessment, Research & Evaluation, 2, no. 11 (1991). 10 Jaeger, Richard M. “About Educational Indicators: Statistics on the Conditions and Trends in Education.” Review of Research in Education 6, no. 1 (1978):276-315.